"...The second movement is just ravishing in the beauty of the Chicago's playing and Reiner's romantic approach; there is some staccato triple-tonguing done by trumpeter Adolph Herseth in the fourth movement that should leave you, if not him, breathless. But let it just be said that, after you hear this, no other Scheherazade will ever replace it in your affections." The jewel in the Living Stereo crown. 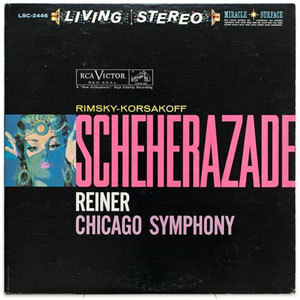 This, like the Respighi, is considered one of the very best LPs by Reiner, the Chicago Symphony Orchestra and RCA's crew. Another Mohr and Layton classic. The original tapes were in the New York area so Kassem enlisted Sterling Sound and George Marino trained cutting engineer Ryan Smith. Tapes were played back on the late Marino's Mike Spitz modifier ATR 102 and lacquers cut on Sterling Sound's VMS 80 lathe meticulous maintained by Barry Wolifson and sent to Kassem's Salina Kansas based QRP pressing plant. The results were so far superior in his opinion to what the older metal parts produced that he decided to green light an ambitious RCA Living Stereo reissue program using original 3 and 2 track tapes, all cut by the young Mr. Smith and plated and pressed at QRP. Kassem's reissued feature "Tip-On" jackets like the originals and meticulous attention was paid to the artwork. If you look at the back jacket of this release and compare the photo of Fritz Reiner there to Classic's you'll see a dramatic difference. The Analogue Productions version's photo is dramatically better. In fact it's better than the original as well as is the entire physical packaging. As for the sound, well I get into arguments all to often with people who insist originals are always better. If after comparing this reissue to the original they still think so, they are hopelessly prejudiced. This reissue easily beats the original I have in every category Of course the original can't begin to approach the 200g QRP pressing quality, especially in terms of velvet-black backgrounds and perfect surfaces. The reissue is far more dynamic, the low frequency extension complete, and most importantly the instrumental textures and tonalities are rich, full and spectacularly transparent. All of the delicacy, three-dimensionality and transparency promised but only partly delivered by the original is fully communicated on this Analogue Productions reissue. Both the music and the sound are transportive, making this easy to recommend even if you think you don't like "classical" music. If you're looking for a way "in" here it is! "We compared this new 200-gram, 33-rpm LP from Analogue Productions with the original RCA Living Stereo issue, and Classic Records 33rpm version, and were surprised at the outcome. Why? Because to these ears, the new Analogue Productions version was the more relaxed and natural sounding of the bunch. The sound is as it should be, inviting the listener into the music and entirely consonant with Reiner's readings. This transfer bespeaks a confidence in the sound on the master tape, without the artificial touch-ups (a brightness) later found in the original Living Stereo pressing and the more pronounced jiggering in the version from Classic Records. "RCA graced this recording with some of their best engineering. Rimsky's orchestration seems tailor-made for a sonic showcase and this is exactly what the RCA engineers gave Reiner's well-nigh perfect reading. It is a reading of great subtlety and romanticism, which brings this too-often played piece to a newfound life. And so worth getting to know again if you've drifted away from it.